The doctor office availability isn't updated proper as Dr. Gupta wasn't in but I was seen by Dr. Bennett and shewas kind and amazing! The doctor office availability isn't updated proper as Dr. Gupta wasn't in but I was seen by Dr. Bennett and she was kind and amazing! I was seen quickly and Dr. Gupta was efficient and knowledgeable . His bedside manner was fabulous and he lessened myworries about my problems. I was seen quickly and Dr. Gupta was efficient and knowledgeable . His bedside manner was fabulous and he lessened my worries about my problems. Dr. Ambrish Gupta specializes in cardiovascular disease, internal medicine, geriatric medicine, aerospace medicine in Arlington, Virginia. Dr. Gupta has 33 years of experience as an MD, and has 2 hospital affiliations. 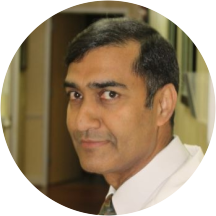 Dr. Ambrish Gupta identified specializing in Cardiovascular Disease, Internal Medicine, Geriatric Medicine and Aerospace Medicine. He obtained board certification from the member board for Internal Medicine and has a professional membership at the American College of Physicians. Dr. Gupta was fantastic! Very personable, intelligent, and took his time listening to you. Only con was the equipment in the facility (mclean medical center on Old Dominion) seemed incredibly outdated. Other than that, the doctor and staff were great! Great Dr. Office. I was able to get all my test results and Shalini Jain was great. The office staff was very pleasant. Dr Gupta was very approachable and professional. I definitely recommend him. He was great. He was very thorough and explained everything to me very well. Practice was advertized on web as providing dermatological services. This was not the case. I stated on zocdoc that I had a small growth I wanted someone to look at and that's about all they could do since they don't haveequipment to freeze, remove or biopsy such growths. Very disappointing. Dr. Gupta is personable enough, but his attention to what is going on with the patient is severely lacking. His PA did a verbal review of systems, and then he came in an did not ONCE touch he patient. And thiswas a first visit - he was interested in doing tests (which is fine) but not on listening to the patient as well. I will give him the benefit of the doubt, but the way he conducted the visit creates concern. There aren't too many doctors left that want to hear all of your questions and let you keep asking them until you feel like you have all the answers you need or want, Dr. Gupta is one of those. He isinformative and gives honest answers, not just ones that he thinks patients want to hear. Very professional and friendly environment? Dr Gupta was very thorough and took the time to explain and answer all my questions. When I finally went back into the doctor's office, the technician and doctor were fast, efficient, and friendly. However, the receptionists seemed disorganized and I waited nearly an hour before being seen. Since I was not in a rush, it wasn'ta problem, and it might be worth going back since the doctor was very helpful and friendly. I waited forever to be seen by the doctor even though I got there 20 minutes early.